Relaxing and working as a freelancer in the same environment is extremely difficult. It works out so rarely that the first thing you should do as a freelancer is to get a dedicated working place. It can be a corner of your room, a separate place in your house, a co-working environment or even the local library. Getting into the mindset that you’re at a place with a specific purpose will do wonders for your concentration. And vice versa – stepping out of that zone will let you relax without constantly stressing out about your email’s inbox. Yes, I am aware that this tip is as obvious as they get, but you would be surprised how many freelancers fail to set priorities even though they know they should. Having a certain schedule for specific tasks helps. If you are working on a big project with a tight schedule, spend less time on your marketing than you usually do, even if it means changing a rhythm you’re used to. The feast and famine cycle is an inseparable part of many a freelancer life. Planning for it can make the difference between achieving your dreams and going bankrupt. If most of your clients are away for the summer and projects don’t come in at the usual pace, save beforehand. Then, you can take a break or focus on all those things you’ve been putting off so you’re ready and energized for the next work-heavy period. Relying on one big client is often how most freelancers get started, but breaking out of that pattern can be essential for your success. Having multiple clients will guarantee that even if something unexpected happens to one of them, most of your income is still secure. We’ve mentioned the need and usefulness of saying “no” in the recent past. In case you missed that, here’s your reminder. Sometimes refusing to a client, project or even the voice inside your own head is the best way out of a difficult situation. Security is a big part of feeling happy, whether as a freelancer or otherwise. The easiest way to obtain professional security as a freelancer is having people you can rely on. Go to conferences, join on- and offline communities and make acquaintances or even friends. Don’t be afraid to share projects, extra work and a part of your success with them – they might do the same for you in the future. Being a freelancer means that you’re the HR department of your own company. That means not only knowing your strengths and weaknesses and acting on them, but also knowing when you did a good job. Don’t forget to acknowledge your own hard work and give yourself a reward for it. Freelancing can get lonely sometimes. Denying that fact won’t help, but working towards a change can. Try going out on your breaks and find a hobby that gets you somewhere other than your home. Loneliness is a real issue with possibly severe repercussions – do something against it! 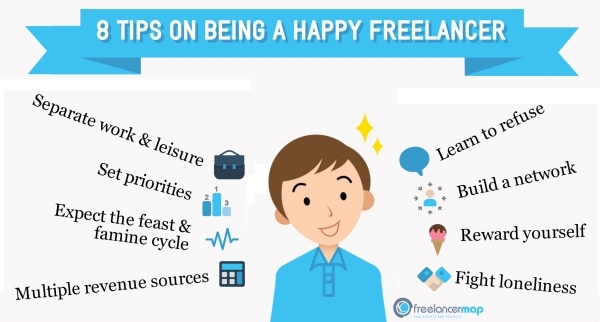 What gives you happiness in your freelancing career? We would love to hear from you in the comments below this article! Viktor Marinov is the voice behind the freelancer magazine at http://www.freelancermap.com. Every week he comes up with helpful hints, checklists and guides for freelancers and independent workers. If you would like to know how to find remote jobs online or how to niche yourself as a freelancer, check out his freelancer tips! Beginning a freelance career can be challenging. It involves giving up financial security, a set routine, and is a usually big step out of your comfort zone. However, transitioning from a regular day job to freelancing doesn’t have to be terrifying, or a huge risk. You can start freelancing on the side.